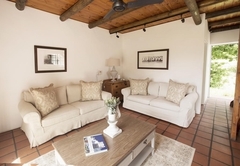 Klein Waterval Riverside Lodge is one of the Franschhoek guest houses and provides accommodation in 12 guest rooms for tourists visiting the Cape Winelands region. 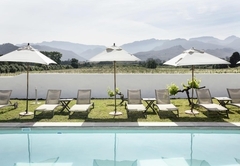 In the Franschhoek Valley on the banks of the Berg River, surrounded by vineyards and dramatic mountain views, Klein Waterval Riverside Lodge offers friendly country hospitality in a relaxed farm atmosphere. 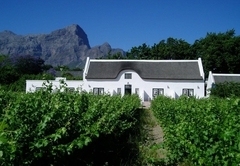 We are situated on the R45 in Groot Drakenstein, which is about halfway between Paarl and Franschhoek. 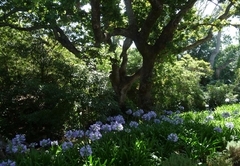 Stellenbosch is a mere 20 minutes away, Cape Town 50 minutes and Cape Town International Airport 60 minutes. 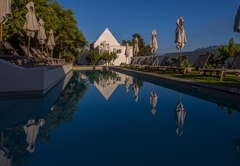 There are twelve en-suites bedrooms which consist of twin rooms, double rooms and suites each with their own private entrance and veranda, all with splendid views of the mountains, lush gardens or vineyards. 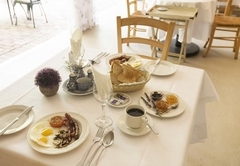 Our rates are seasonal and differ according to the various rooms. 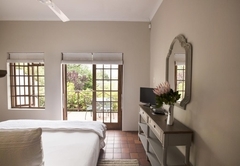 Each guest room has a personal safe, ceiling fan, hairdryer, TV set with M-net and special DSTV channels, wall heater, tea and coffee tray and telephone. All twelve rooms are non-smoking, but smoking is permitted outside on the veranda. 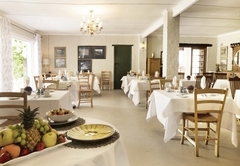 A choice between a farmhouse or continental breakfasts may be taken in our beautiful breakfast room or on the veranda. 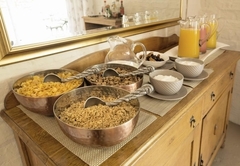 We also have a fully licensed “Honesty Bar” for our guests to enjoy a sun downer in the afternoon or a nightcap after dinner. 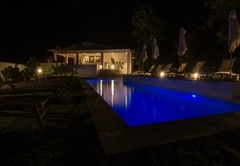 We have Wi-Fi available in the entire guesthouse including rooms, swimming pool ect. Klein Waterval has secure off-street parking available with a security guard on duty 24 hours a day. 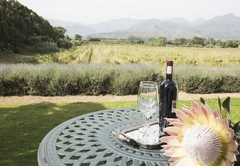 We can arrange transport to and from the airport, tour guides as well as wine tours. 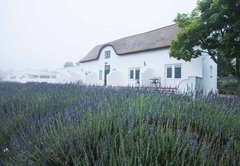 The conference room opens onto a deck that overlooks vineyards and mountains, the venue seats up to 45 delegates with basic facilities and break away rooms. 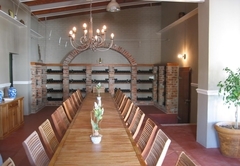 A braai can be held if organized in advance or dinner at one of the nearby Franschhoek restaurants. Our standard equipment includes white board with markers, flipcharts, pen and paper and should any additional equipment be required it can be ordered on your behalf and charged accordingly. We’ve got options of half day and full day conferences available. 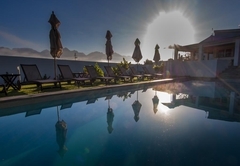 There are various activities at the lodge which the guests can enjoy such as walking down to the Berg River and watch the different stages of grape farming or merely to relax around the big swimming pool. Klein Waterval is the ideal spot for anyone who wants to relax, unwind and enjoy our country hospitality and majestic views. 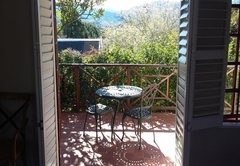 Double bedded (king-size) en-suite shower only overlooking the garden with mountain views. Each guest room has a personal safe, ceiling fan, hairdryer, TV set with M-net and special DSTV channels, wall heater, tea and coffee tray and telephone. 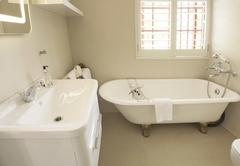 Twin bedded en-suite shower only overlooking the vineyards with mountain views. Each guest room has a personal safe, ceiling fan, hairdryer, TV set with M-net and special DSTV channels, wall heater, tea and coffee tray and telephone. 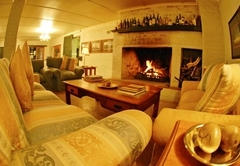 Suite-double bedded (kings-size) with bath, shower and lounge downstairs overlooking the vineyards with mountain views. 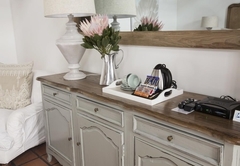 Each guest room has a personal safe, ceiling fan, hairdryer, TV set with M-net and special DSTV channels, wall heater, tea and coffee tray and telephone. 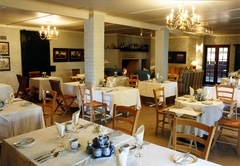 Response timeKlein Waterval Riverside Lodge typically responds to requests in 5-10 minutes. 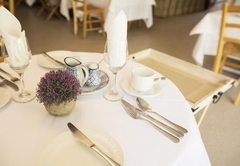 Exceptions to check-in/out times may be arranged during Low Season, please enquire.